The Pentagon quickly retracted a claim that Iraq had developed a top secret plane with an advanced Stealth technology superior to that on the B-2; a plane capable of travelling at 4 times the speed of sound and able to carry enough nukes to wipe out 4 New York sized cities. CIA claimed that whilst the plane wouldn't be able to travel at Warp Speeds like this photo suggests, it would be so fast it would appear to. 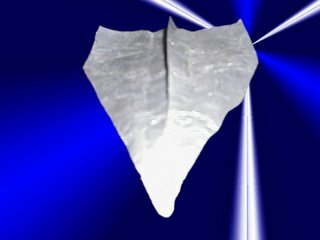 Having obtained photographs of the design, Pentagon officials claimed that the plane�s Concorde appearance was so advanced it would be able to fly undetected in higher altitudes than the SR-71 Blackbird Spy plane. Coupled with a mission range of 20,000km that CIA sources claimed the plane was capable of it would have been able to attack any city with little or no warning for the target to react. 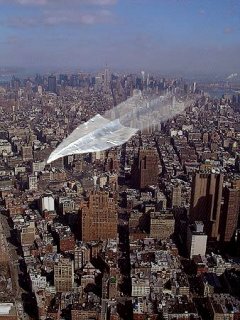 The CIA revealed that if the plane was to fly over New York it would look something like this. 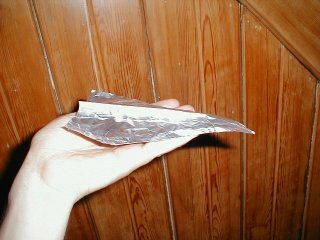 However, shortly after revealing the evidence supporting the Iraqi creation Pentagon officials suddenly made an impromptu press conference, admitting that the plane was actually only a aluminium foil model and less than 8 inches in length. They apologised for any inconvenience caused by the mistake but insisted the evidence they had gathered had convinced them the plane was for real. When questioned about the photographs distributed to the press, the CIA admitted they had doctored them � but only to demonstrate the devastating attacks they predicted the plane would cause. However, when one photograph of the plane appeared on the Internet the CIA was forced to admit that they had got their facts slightly wrong. After this photograph appeared on the Internet the CIA was forced to admit they'd been duped and the plane was just a model rather than an ultra model secret Iraqi Bomber.